Estes Park Snowshoeing is one of Colorado’s greatest winter sports. Seek solitude. Enjoy the snow! Venture into Rocky Mountain National Park to explore its winter glory. One very fun, quiet, and simple way to enjoy the back-country is to cross country ski/ snowshoe. A wonderful winter sport, that is great for all ages. Do you love birds and the great outdoors? Kaiyote Tours specializes in guided birding and outdoor adventure tours all over the world! Located in scenic Estes Park, Colorado, it offers hiking, horseback, llama pack, and snowshoeing trips in Rocky Mountain National Park! This is the place to go for all your hiking, backpacking and showshoeing gear. Equipment can be rented at affordable rates. Yellow Wood Guiding is your personal tour guide for photography, wildlife, and snowshoeing in Estes Park. Choose from a range of tours and safaris. Park rangers guide snowshoe tours that are informative, safe, and fun! The west half of the park is known for its fluffy white snow. The east side is dryer with patchier coverage. Where can I go snowshoeing? Estes Park snowshoeing is a popular sport on Rocky Mountain National Park trails! While the east side doesn’t receive much snow, the west side of the park is a wintertime heaven. The best months for snowfall are Jan-March. 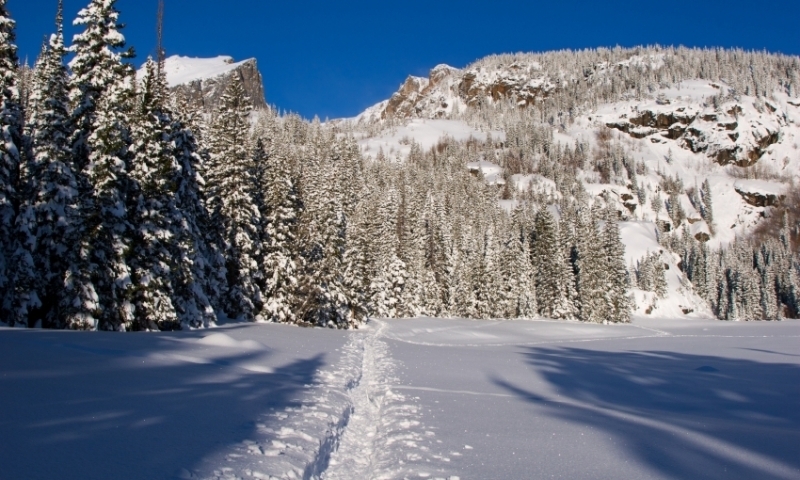 Great routes for snowshoeing are around Bear Lake, on the east edge of the park, and in the Grand Lake area. Ranger-led snowshoe tours are also available, so give them a call! (970) 586-1206. If you don’t go out with a guide, be sure to call and ask about current snow conditions and avalanche dangers. This hike is a great place to start your snowshoe adventures. The forest engulfs the trail, so your exploration is through a winter wonderland. Put on your wool socks, hat, gloves, and goggles, and enjoy the snow! Trailhead: Bear Lake Trailhead. You’ll be able to spot which trail to take. In the winter, it’s marked with bright fluorescent squares because it’s a popular cross-country ski trail. On this wonderful hike you’ll snowshoe past Bear Lake, Nymph Lake, Dream Lake, and finally Emerald Lake. Remember to take in the views: Flattop Mountain, Hallet Peak, and Longs Peak. Trailhead: Bear Lake Trailhead. Nymph Lake approaches fast. Continue around the lake’s edge. The trail enters forest. Continue on and you’ll find the following frozen waters. This climb is for a serious snowshoer! Trailhead: Onahu Trailhead. Go left at the trailhead and climb the first 4 miles. Descend to Big Meadows. After Big Meadows, head west on Green Mountain Trail, which completes your loop. This loop is on the west side of the park, where the snow is known to be in great condition. There’s a larger loop if you continue north on the trail, making your adventure 4.6 miles long.